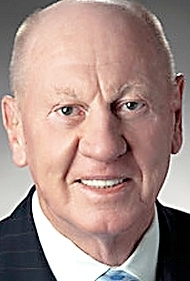 Isdell was named to the GM board in 2008 after turning around Coca-Cola Co.
DETROIT (Bloomberg) -- Retiring General Motors director Neville Isdell has a parting message for CEO Mary Barra: Yes, GM has come a long way since the bankruptcy and is in capable hands, but the turnaround is far from complete. In an exclusive interview, Isdell, 71, said some of the institutional arrogance that got the company in trouble is still there despite Barra’s efforts to foster a humbler culture. He also criticized marketing at the bread-and-butter Chevrolet brand and said Cadillac may need to spend even more than a planned $12 billion to be a force in global luxury. Named to the board in 2008 after turning around Coca-Cola Co., Isdell has had a front-row seat on one of the most tumultuous corporate dramas in recent years. He witnessed GM’s near collapse and revival, a revolving door of chief executives, and record recall including millions of small cars with defective ignition switches linked to 100 deaths. Isdell said the board chose Barra as CEO because she knows how the company works and sees the challenges clearly. The directors selected Dan Ammann as president because the former investment banker is an outsider who likes to challenge GM’s status quo, Isdell said. Barra weathered a tough year that included being hauled before Congress to explain why it took more than a decade for GM to recall fatally flawed cars, Isdell said. With the ignition-switch recall mostly behind her and sales and profits growing solidly, Barra can focus on unresolved issues. Isdell is especially critical of the marketing of the Chevy brand. More than two years after the debut of Chevrolet’s “Find New Roads” advertising campaign, Isdell said, many consumers still don’t realize that the quality of its sedans and compacts has improved dramatically. Isdell, lauded for turning Coke Zero into a hit, made his feelings known to Chevy management but “they didn’t want to listen.” In an interview, the brand’s marketing director Steve Majoros said the “Find New Roads” campaign is about discovery. Coupled with the brand’s other advertising and social media work, it embodies that spirit, he said. Still, it’s hard to argue with Isdell. In 2011, about 20 percent of new-car shoppers said they’d consider a Chevy; last year only 18.4 percent did, according to Alexander Edwards, president of researcher Strategic Vision Inc.
Isdell said new models like the Malibu family sedan and Camaro sports car coming out this year should help the brand, which still enjoys a good reputation for trucks. Cadillac is in a similar spot as Chevy, he said, but also is in the early stages of spending $12 billion on new product. “I don’t know if $12 billion is enough, but it’s a start and it will move the needle,” he said. Barra’s predecessor, Dan Akerson, knocked heads together and earned a reputation for being tough on longtime staffers. Former Chairman and CEO Ed Whitacre axed management layers and unnecessary meetings. But Isdell said it’s still not unusual to hear GM vets claim to be the best at something or denigrate the competition. That doesn’t sit well with a guy who once made a Coca-Cola team in the Philippines wear Pepsi shirts and drink the rival’s cola to get them thinking like the competition. Isdell said Barra is well aware of problem and trying to address it. Barra is an “internal revolutionary,” who knows what’s wrong with the automaker and wants to change it, he said. It helps that she’s respected inside GM and can rally people behind her, he said.